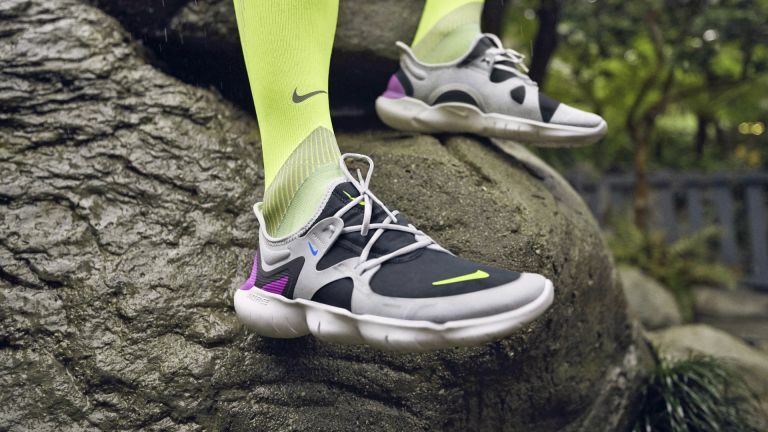 Nike Free is Nike's 'barefoot' line of running shoes, but unlike certain shoes of that nature, it doesn't look like a great big, cartoon foot. We don't know about you, but this is a big plus for us, sneaker style-wise. The latest iterations – Free RN 5.0, which you can already buy, and Free RN 3.0 which is meant to be ready to buy but doesn't seem to be on the Nike Store yet – are lower to the ground and more flexible than ever. These trainers are currently a Nike members' exclusive so you will have to sign up for a Nike Plus account if you don't already have one. Nike Free shoes are for what Nike calls 'lower-mileage runs', which in our book means going to the local supermarket. The foam cushioning in the midsoles is firmer, flatter and lower to the ground, so that rather than feeling like you're in orthopaedic shoes with pillows strapped to the bottom, you have a greater connection with the ground and a more natural, flexible feel. Since the current trend is for absolutely massive, bulbous and fugly trainers, Nike has styled these so the sole and midsole look quite large and alien but actually the shoes are lower to the ground than any Free sneakers to date. Advanced data mapping is used to map the sole, with grooves where the foot naturally wants to bend, with 'stretch to enhance the feeling of movement and to allow for more natural foot motion.' Nike Free RN 5.0 is '26% more flexible' and 2mm lower to the ground than last year's model. The more elusive (so far) Nike Free RN Flyknit 3.0 is 1mm lower to the ground than the 2018 models. As the name suggests, a Flyknit upper is used and there are NO LACES. How future. The 3.0 is more expensive and, if you want our opinion, a better looking shoe. But you'll have to wait for it. • Nike Free RN Flyknit 3.0 will be £129.95 when Nike gets around to stocking it.